Momo is a flying squirrel, and his cousins are excited for him to come visit. But when Momo comes into town, his cousins soon realize he isn’t quite what they were expecting. Momo is shy, he dresses differently, and his idea of pretending to be a superhero is wearing a giant muffin costume! Momo’s cousins are frustrated at first, but they soon learn that giving Momo’s way a try can lead to fun for everyone – Momo teaches the cousins a tasty new way to play Acorn-pong, while the cousins convince Momo that their version of hide-and-seek is the most fun. 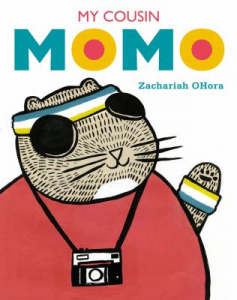 Zachariah OHora’s illustrations in My Cousin Momo are one-of-a-kind – picture book fans may recognize OHora’s unique style from other greats such as Wolfie the Bunny and No fits, Nilson!. This hilarious picture book demonstrates the important lesson of celebrating one another’s differences with perfectly executed depictions of scowling squirrel cousins and rodents in pastry costumes.